We explored the world of arts for some time now and found out that we need to get you a good chalkboard so you can use our awesome liquid chalk markers as much as you like. Chalk markers can be tricky, we know that. They are beautiful and the colors are bright and vibrant but you need to use them only on 100% non-porous surfaces if you want them to come off easily. 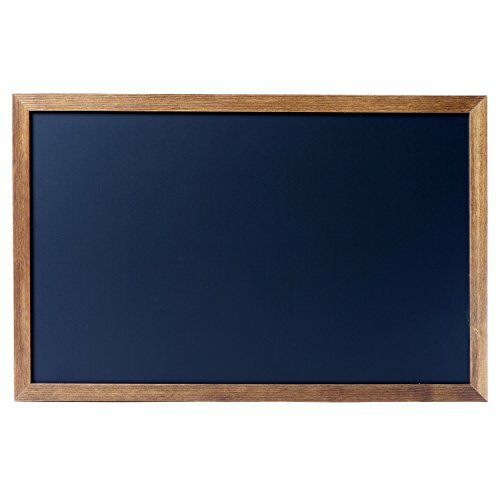 We created a framed chalkboard that is perfect for this application. It is specially made for our Cedar Markers chalk markers so they will wipe off in case you want to change something or start over. The slate like wood frame makes it even more attractive. ⚡ 100% NON POROUS - Great for our Chalk Markers. Just wipe off with a baby wipe and start over. ⚡ DOUBLE SIDED - Enjoy the 2 sides of the erasable magnetic chalkboard. 1 side Black and 1 side white. ⚡ PERFECT SIZE - Perfect size 27"x20" for posting or hanging on the wall. Ideal for offices or restaurants. ⚡ WOODEN FRAME - Comes with a wooden frame and a hanging set. ⚡ 100% GUARANTEE - As always, Cedar Markers guarantees a replacement or refund. Purchase now! View More In Memo Boards. If you have any questions about this product by Cedar Markers, contact us by completing and submitting the form below. If you are looking for a specif part number, please include it with your message. Maison Plus 9 Pc Mini Slate Markers Set (3.15" X 2.13") with Lily Cook Double Sided Chalkboard Table Easel (4.5" X 8.2") - For Parties, Seat Assignments, Food Displays, Any Special Events.